How do we know the Earth is older than literalistic readings of the Bible seem to imply? 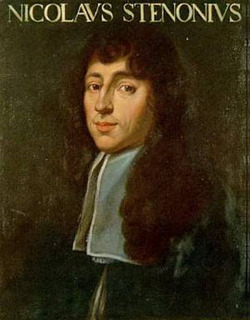 Nicolas Steno (1638–1686), the Catholic bishop who formulated foundational principles in stratigraphy, paleontology, and even crystallography. Geologists have been wrestling with this question for centuries, especially those pioneers in the Earth sciences (e.g. Nicolas Steno, William Buckland, Hugh Miller, Thomas Chalmers, and even Charles Darwin) who were also devout clergymen or at least trained in natural theology. The 19th century in particular may be characterized by the massive, interdisciplinary effort that sought to answer the question scientifically: how old is the Earth? But it was not until the mid 20th century that all efforts began to converge on the value we now accept: 4.56 billion years. Today, a resurgence of young-Earth creationism has many persuaded that science, when applied faithfully, still supports a much smaller age—close to only 6,000 years. While the arguments behind this movement are not convincing to professional geologists, as I’ve sought to elucidate on this blog, their popularity highlights the need to summarize coherently the positive evidences in favor of ‘deep time’. Below, I have compiled what I deem the 100 most convincing reasons—in no particular order—that the Earth is not less than 10,000 years old. Those readers from a young-Earth background might be quick to point out that many of the evidences listed below have been refuted by creation ministries in their article databases. But that’s no coincidence. Those article databases are primarily built to rationalize what are indeed strong evidences against the young-Earth position. So please note, I am keenly aware of those counter-arguments, and therefore I encourage you either to follow the links to in-depth discussions of each evidence or to contact me directly about why I find such counter-arguments unsatisfactory. How do we know from geology that the Earth is greater than 10,000 years old? Tree-ring “long counts” from California, Central Europe, New Zealand, and Scandinavia extend up to ~13,000 years. These chronologies are constructed from hundreds of individual trees that overlap, so that even if a tree did produce multiple rings during a growth season, the ‘extra years’ would disappear in the correlation process. Even John Woodmorappe has written that these tree-ring chronologies cannot be explained by multiple rings being produced in a single year or the mismatch of individual tree records. Annual bands in the cross section of a temperate tree (original image here). The oldest individual bristlecone pine trees date to ~5,000 years old by dendrochronology (ring counting), which is older than the traditional date for Noah’s flood. Since we have no reason to suspect that these trees could have formed multiple rings in any given year, these trees provide two constraints: 1) the flood, if it were global, occurred more than 5,064 years ago, and 2) the Earth’s surface, where the trees were growing, has been identical to modern day over the last 5,000 years. The latter point is important, because flood geologists must assume that catastrophic geological processes continued for centuries after the flood to explain Quaternary deposits and erosional features like Grand Canyon or the Channeled Scablands. Long-term records of glacial ice can be dated by counting annual layers beyond 10,000 years. These annual layers can be recognized not only by appearance, but variations in chemistry, which removes any assumptions about growth rate during these intervals and precludes the possibility that multiple rings formed each year. Varved sediments with more than 10,000 layers, such as Lake Sugietsu, Lake Van, and the Cariaco Basin, to name a few. Geologists don’t just assume that these layers are annual, but must demonstrate rigorously that each layer exhibits some kind of seasonal signal (characteristic isotopes, organic matter, or mineral content). From Figure 4 in Reimer et al. 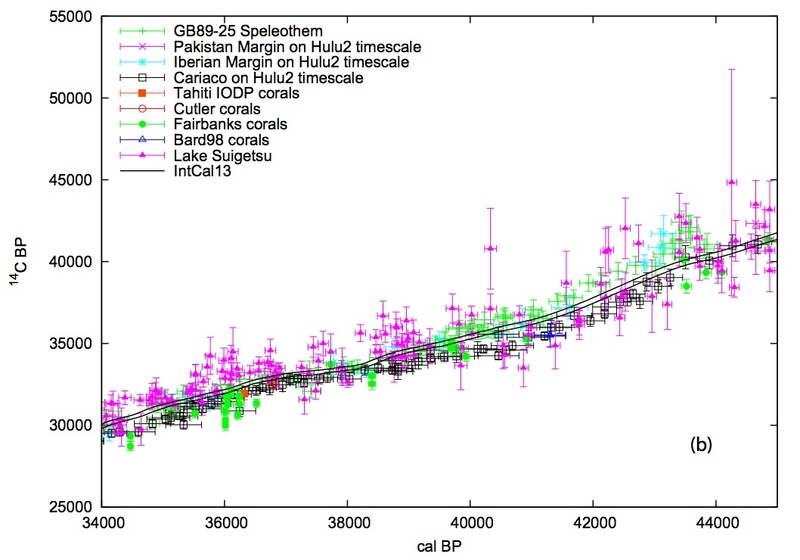 (2013): example of radiocarbon calibration, plotting the radiocarbon age of samples against their known age (between 34–45 ka). Radiocarbon calibration curves confirm that annual layers in trees and varved sediments are indeed annual. The radiocarbon age of annual layers within these deposits are always within ~10% of the age predicted by layer counting, back to nearly 50,000 years. If these layers accumulated catastrophically, or if the radiocarbon method were fundamentally flawed, we should not expect such a match. Additionally, since YEC’s suppose that radiocarbon ages are only apparently old (due to low 14C concentrations during and after the Flood), every marine, tree-ring, and varved lake chronology must be compressed down to ~4,000 years. In other words, the YEC paradigm would predict that trees, glaciers, corals, and seasonally active lakes regularly form 4-10 ‘annual’ bands every year. But they don’t. There is no radiocarbon in old samples, despite claims to the contrary. Geologically old samples of coal, diamonds, and graphite, for example, yield finite radiocarbon ages that are consistent with the expected level of contamination invariably introduced during sample collection and preparation. Continuous coral chronologies from modern communities (i.e. not buried in sediments) extend throughout the Holocene. Corals contain annual bands and may be combined like tree rings to construct long-term chronologies, or dated by the radiocarbon and/or U-Th method. Applying these tools, geologists use corals to reconstruct sea level over the last few tens of thousands of years (or more!). Cross section of a stalagmite prepared for stable-isotope analysis. Drill pits are from powders collected for U-Th dating. Image from UT-Austin media release. Secondary cave formations, such as stalagmites, can form relatively quickly (1–2 mm/yr) in tropical climates or where summer monsoons bring large volumes of precipitation to the cave system. For caves found in temperate or arid climates, however, the growth rate of stalagmites can be incredibly slow (<0.1 mm/yr). Advanced techniques in U-Th disequilibrium dating confirm what geologists long suspected: these iconic formations took tens of thousands of years to reach heights of half a meter or more. Large subterranean caverns do not form overnight, especially outside of tropical climates. The dissolution of caves is a rather slow process, due to the limited solubility of calcite in very slightly acidic rainwater. Although the process can be accelerated in the presence of active soils or even hydrogen sulfide (a microbial byproduct of petroleum degradation), the sheer size of natural monuments like Mammoth Cave and Carlsbad Caverns cannot be explained in a young-Earth timeline, especially given that these caves are lavishly decorated by secondary formations, which themselves take thousands of years to form. Large terrestrial lakes and inland seas have accumulated more than 10,000 years worth of deposition. Examples include the Black Sea, Dead Sea, Caspian Sea, Lake Baikal, Great Salt Lake, Lake Van, Lake Ammersee, Lake Sugietsu, and Lake El’gygytgyn, to name a few. These lakes are dated by combinations of radiocarbon, annual band counts, and isotopic records that correspond to climatic trends from ice cores. Some contain evaporite layers, indicating that the lakes dried up in the past. In the cases of Dead Sea and Great Salt Lake, this happened many times in the past on glacial-interglacial scales. Lake Baikal in Siberia has collected sediments that are inconsistent with any catastrophic inflow from the surrounding region. The sediments at the lake bottom are rather fine-grained, free of terrestrial plant debris (aside from microscopic pollen near the shoreline), and contain abundant diatoms. These diatoms flourish in the summer months but settle very slowly to the lake bottom, so their presence throughout the sediment column confirms that sediments accumulated under normal conditions, similar to today. Therefore, we can confidently say that the lake basin is potentially millions of years old, given the sheer thickness of lake-bottom sediments. Well developed river flood plains span large areas of temperate and tropical regions of Earth. These flood plains develop over long intervals of time as periodic flooding and migration of the river channel slowly erode the bedrock down to a flat surface. Attempts to describe vast planation surfaces by the retreat of flood waters do not work, because during floods, erosion is localized in channels that form along ‘weak points’ in the underlying rock and sediment. If this erosion took place soon after the Flood, the sediment would still be soft, exacerbating the localization of erosion in deep channels. Slithering stone in Death Valley. Photo by Momatiuk – Eastcott/Corbis photography. Painfully slow erosional processes in modern deserts, involving wind, ground tremors, or even ice, are the best explanation for some rather bizarre boulders scattered across the dunes. Slow tumbling boulders in South American deserts, for example, had to be weathered slowly by wind in the arid highlands, and cosmogenic dating confirms their old age. 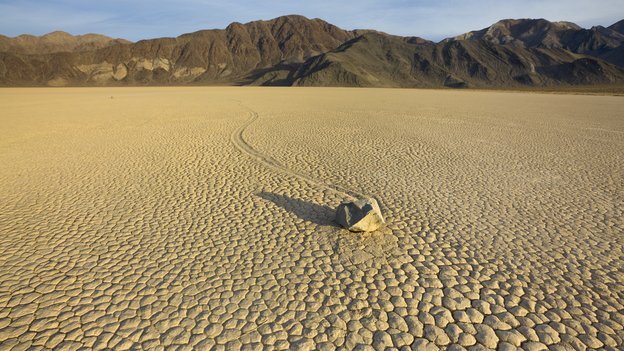 Slithering stones of Death Valley, on the other hand, were proven to move only by seasonal ice. These findings imply that the modern landscape has changed little in thousands of years (if not millions!). Evidence for numerous glacial cycles during the Quaternary (i.e. the past 2.6 million years) is particularly abundant in the northern hemispheric continents of North America and Eurasia. These evidences include glacial tills and terminal moraines, which are buried within layers of Quaternary aged sediments. Between these glacially derived layers, relatively warm-weather plants populate the sediments of old river valleys, indicating that climate rebounded after each ice age to one similar to what we find today. Quaternary deposits and landscapes are far too complicated to have accumulated in the ~4,500 years following the Flood. Everywhere we look on Earth, we truly find evidence for ~2 million years worth of processes, whether at high latitudes (where we find evidence for repeated glaciations and deglaciations, separated by warm intervals) or in the tropics (where we find thick desert dune sequences alternating with humid intervals) or in the oceans (where 2 million+ years of Milankovitch cycles are recorded in only a few meters of silt and clay) or in the high mountains (where alpine valleys have been carved out by rivers or glaciers, then infilled by coarse sediment, then eroded again, etc.). Flood geologists unanimously assert that the Quaternary period represents the ‘post-Flood’ era, but there is good reason that conventional geologists ascribe a much longer age: 2.6 million years. Dropstones in a glacial diamictite from Death Valley, California. Image credit. and cold intervals beginning the Late Ordovician and Late Pennsylvanian periods, are found within the geological record and so must be reinterpreted by Flood geologists as submarine deposits of boulders and mud during Noah’s flood. Though ancient tills do occasionally resemble submarine flows, ancient glaciations are not inferred by these sedimentary deposits alone. Instead, a suite of geological data, from fossils to paleoceanographic data to rock chemistry, all support the idea that the whole Earth was much cooler when these tills were deposited. Continental ice sheets do not form in a matter of centuries, especially those that were more than a mile thick and extended in some cases to southern Siberia and the central Great Plains, USA. 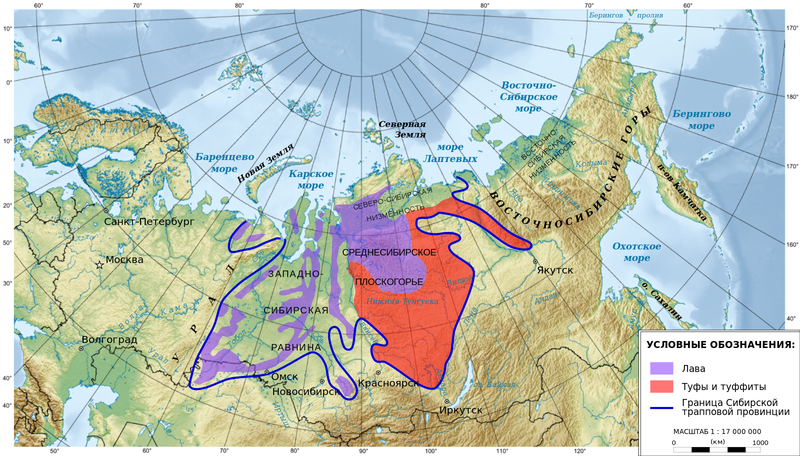 Flood geologists must maintain, however, that massive ice sheets nearly half the size of Russia not only grew, but melted entirely, then regrew, melted entirely, and regrew more than a dozen times in less than 200-700 years (the timeline depends on which YEC you ask!). Human occupations of nearly every continent can be demonstrated beyond 10,000 years, e.g. in South Africa, ruling out the possibility that humans repopulated the Earth after being obliterated only ~4,500 years ago. Ötzi the Iceman has frequently made headlines in creationist writings, because they accurately perceive this unique find as a challenge to the young-Earth timeline. The remains of this murdered Alpine farmer date to ~5,300 years old, which YEC’s arbitrarily dismiss as “inflated”. Regardless, they do admit that he lived sometime in the beginnings of human civilization (i.e. very soon after the Flood), and so they attempt to turn the argument on ‘evolutionists’ by emphasizing the level of technology (tools, agriculture) carried by Ötzi and his village—”How can this ‘primitive’ man be so advanced?” This response is a non sequitur, because the artifacts found with Ötzi are entirely compatible with reconstructed histories of European peoples. What YEC’s overlook is the geological context of the body: it was preserved in undisturbed ice near the top of a mountain range. This tells us that the morphology of the Alps has changed very little since Ötzi was alive. 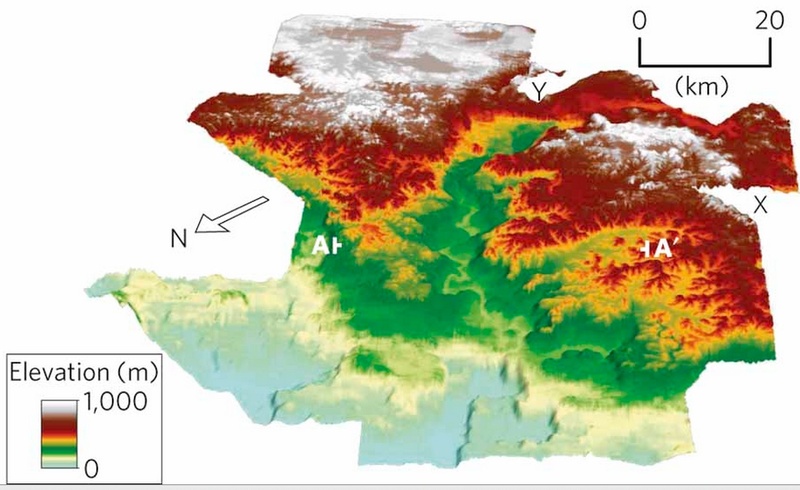 So when did the Alps have a chance to shed the kilometers of sediment that once covered their peaks? The mountains in which Ötzi was found are indeed very ancient, far older than the body of this 5,300-year-old village outcast. Ötzi the Iceman, trapped in ice ~5,300 years before present and nearly perfectly preserved (stomach contents and all!). Human settlements that are now submerged due to sea-level rise have been documented beneath the English Channel, North and Baltic seas, off the coast of Israel, Florida, and beneath the Black Sea, to name a few. For much of human history, global sea level was up to ~130 meters lower than today, exposing far more of the continental shelves and pushing ancient coastlines far away from their modern locations. This allowed for human settlements to develop in sites that are now completely submerged. Following the ice age, however, sea level rose sharply and reached near modern levels at ~8,000 years ago. Whatever the absolute timeline, the young-Earth view allows too little time for human populations to develop, migrate across the globe, and construct large settlements prior to the sea-level rise following the ice age (which they assert happened only a few centuries after Noah’s flood). Fossils record long histories of migration of animals from Eurasia to the “New World”, which cannot be accounted for in the young-Earth timeline. Large mammals such as mammoth, mastodon, and giant sloth reproduce far too slowly to account for the population sizes indicated by fossil graveyards between Siberia and the Americas. There is no record of migration from Central Asia to Australia for many species unique to the land down under. Their ancestors, however, are found in the fossil record and imply that modern populations derived from species that arrived to the island well in the distant past, not after the Flood only ~4,000 years ago. Modern oceans are too salty to have been formed only ~6,000 years ago. We know this salt was delivered slowly to the oceans mainly via rivers (i.e. as opposed to being created in situ), because the relative abundance of salts in the ocean is related to their relative solubilities and abundance in the Earth’s surface. Cenozoic aged marine sediments in the Gulf of Mexico or along the west African and east South American coastlines, for example, are far too thick to be explained by ‘post-Flood’ processes. This fact has caused some YEC’s, such as Michael Oard, to push the ‘post-Flood’ boundary later and later into the Cenozoic and consider these marine sediments as Flood deposits. However, the structure of marine sediments in the Gulf of Mexico and the equatorial Atlantic is clearly related to the modern topography, where large rivers like the Mississippi, Amazon, Congo, and Cross have dumped tons of sediment into the seas, causing massive deltas to form over long periods of time. Due to the economic reward for exploring these sites (which contain abundant oil), geologists have thoroughly mapped out the evolution of ancient deltas through miles of sediment. Their result ubiquitously inform us that the modern landscape is very old and rather stable, and that these late Cenozoic marine sediments were not deposited through catastrophic processes, but by everyday rivers at rates observed today. Deep ocean sediments take far too long to settle to have accumulated in less than 5,000 years. Today, the entire seafloor is covered with microscopic species of plankton, diatoms, radiolaria, etc., in addition to tiny bits of clay and calcite. These particles are so small, that they would remain in suspension under flowing water, so their presence on the seafloor must be explained by a long-time in which they could settle through miles of seawater. 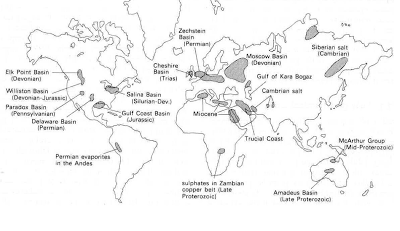 The history of seafloor sediments is further amplified by the fact that marine tephra (volcanic ash layers) occur throughout marine cores around the world, but volcanic ash also needs time and calm water to settle out. A 3,500-year-old volcanic ash deposit from Santorini volcano, in three stages: an air fall pumice (bottom), followed by laminated ash that formed underwater (middle tan layer), covered by a pyroclastic flow (top white layer). Photo by Lee Siebert found here with full description. Volcanic ash beds (sedimentary tuff), frequently used to date sedimentary rock layers, were mainly deposited in dry conditions. Geologists can distinguish between ash layers that settled in ocean basins (marine tephra) and those that fell over dry land (air fall deposits). 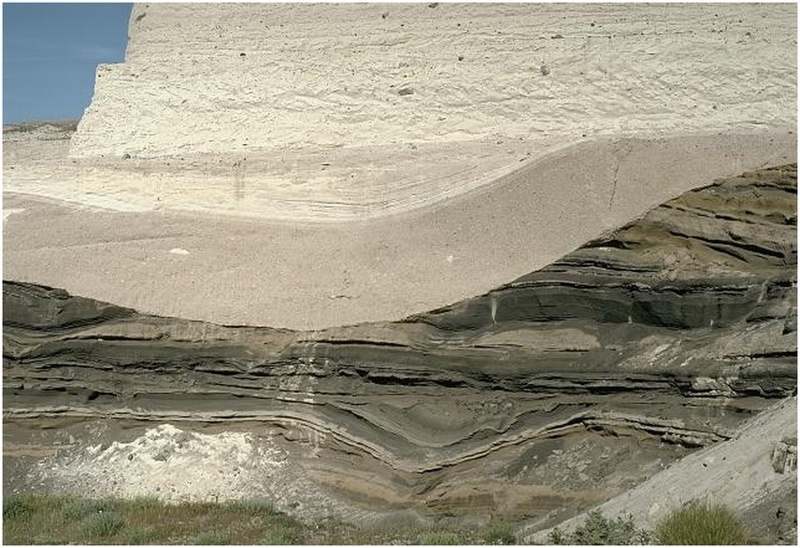 When volcanic ash is deposited in flowing water, it produces yet different features identifiable in outcrops, such as grain sorting and lamination. Therefore, not a few volcanic ashes in sedimentary strata contradict the Flood geology scenario, especially because these ash falls take time to accumulate from the air and harden to the point that water-lain sediments can be deposited on top without compromising the structure of the soft ash. 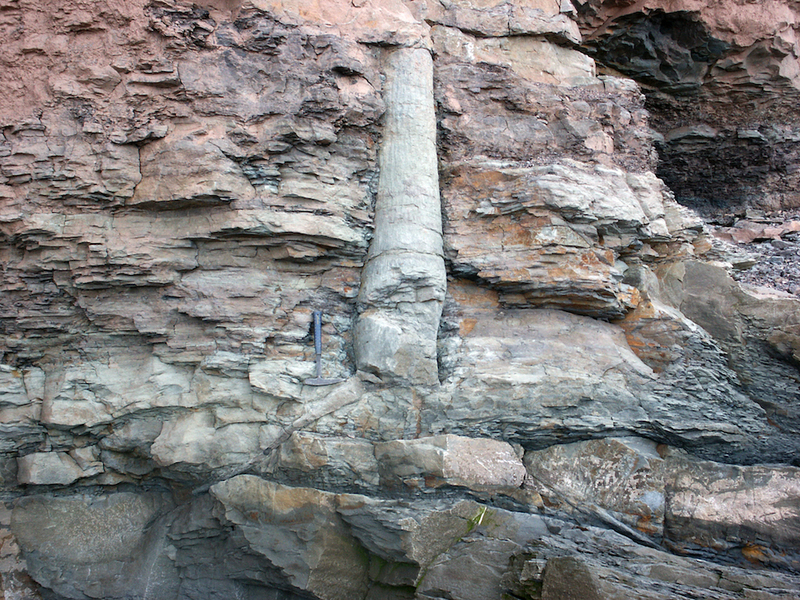 The geologic column is no remnant of an ancient flood deposit, global or not. Fine details, in the form of thin layers of alternating clay and limestone, or irregular sand deposits that resemble modern river channels, defy catastrophic explanation, which explains why catastrophism has long been abandoned by research geologists. There are simply too many sediments buried in the crust to be explained in a young Earth. Contrary to the claims of Andrew Snelling, the ocean floor contains about as much sediment as we might expect after ~160 million years. In addition to ocean sediments still underwater, however, YEC’s must also explain the origin of the trillions of trillions of tons of limestone, sandstone, and mudstone now buried on the continents. These sediments, comprised of broken down minerals, must have originally weathered from igneous or metamorphic material, after which it was sorted by size through surface processes (like rivers, winds, and gravity). But this is not a rapid process, inviting the question: even if a global flood could have buried this much sediment (it can’t), what is the origin of the sediment in the first place? The distribution of sedimentary rocks is weighted too heavily over the continents, which is the opposite of what we’d expect in a global flood. Floods move sediments from high elevation to low elevation, depositing them in sedimentary basins. During the Flood, the oceans would have constituted the largest and deepest basins, but most sediments remained on elevated continents. How did this happen? Did the laws of physics stop working? The “Great Unconformity” in Grand Canyon. Photo by Marli Miller. Angular unconformities became one of the principal evidences against catastrophism in the 19th century, and for good reason. For an angular unconformity to develop, a sequence of sedimentary layers must be deposited horizontally, then tilted or folded above horizontal, then eroded along a flat (or nearly flat) surface, after which new layers are deposited horizontally on top of the erosional surface. We can explain all these steps through modern geological processes. Flood geologists, on the other hand, must explain 1) how these horizontal strata became angled amid the flood, 2) had time to erode to relatively flat surfaces, and 3) why we do not find deep canyons associated with unconformity surfaces, since deep, rapid flowing water would tend to carve into the unconsolidated sediment. This buried landscape, for which little explanation is needed, absolutely defies Flood geology. It is rather a testament to deep time, in which an ancient river valley cut its way though thick sequences of sedimentary rock, only to be buried suddenly and preserved in subtle disconformities between the overlying layers. But these disconformities make for excellent acoustic reflectors, and so the ancient landscape is visible through seismic imaging—a way of treating the Earth to a million-dollar ultrasound. Sedimentary features in limestone are similar to those forming today in shallow marine environments. Everything from ooids (tiny spheres that build up like snowballs under wave action) to cross bedding to mudcracks to karst dissolution in ancient limestones falsifies the young-Earth timeline, because these limestone formations were deposited in calm, shallow seas—not a deep, worldwide flood. Exposure surfaces in limestone are recognizable through features like mudcracks, hardgrounds, and karst dissolution. Karst erosion takes place when relatively acidic waters (like fresh rainfall) dissolve cavities in exposed layers of hardened lime mud. 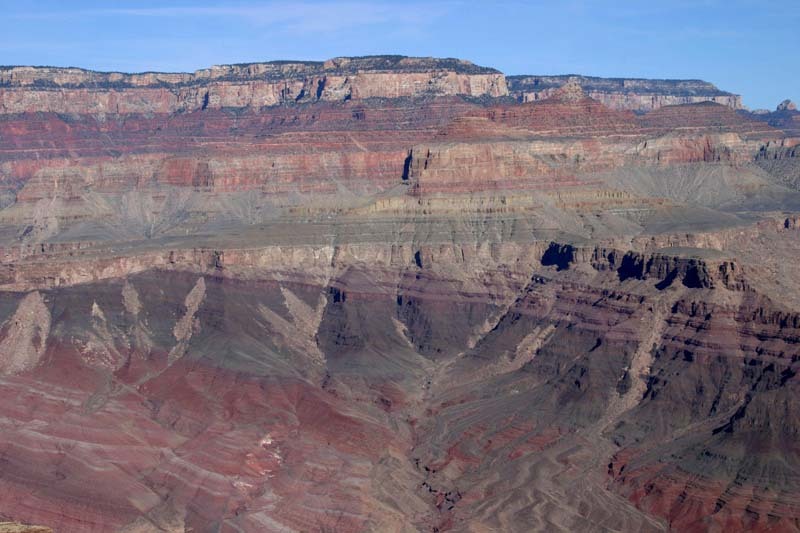 Since karstic surfaces are found throughout the geologic column (including in the Redwall Limestone of Grand Canyon), we can rule out the possibility that limestone layers accumulated under a global flood. Carbonate rocks (limestone and dolostone) comprise more than 20% of all sedimentary rocks, but Flood geologists cannot explain extensive formations of dolostone—(Mg,Ca)CO3—which forms only under unique conditions not seen today in the oceans. To avoid the problem, they speculate that enhanced delivery of magnesium to the ocean (via deep-ocean vents, or the “fountains of the deep”) would have driven the formation of dolostone during the Flood. But in fact, dolomite does not form under these conditions, and so the Flood geology model predicts rather that most carbonates should be comprised of aragonite, the high-magnesium variant of calcite. 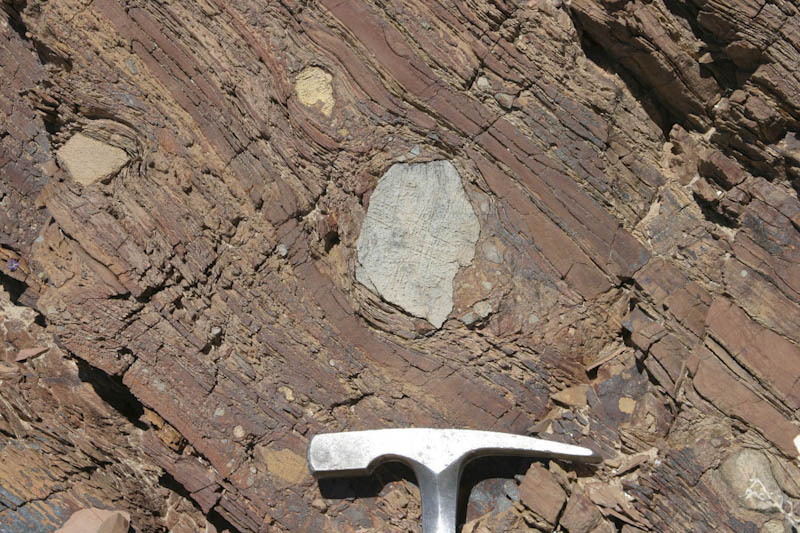 Every piece of dolomite in the geologic record is firm evidence against the Flood model. Areal extent of some major evaporite deposits. Image from Paleobabbler. Flood geology cannot explain the size and presence of massive evaporite deposits in basins like the Gulf of Mexico or the Mediterranean Sea (a small sampling of the world’s sedimentary salt). Halite (NaCl; same as the salt on your food) is extremely soluble in water, especially at higher temperatures. Therefore, Flood waters would have had to evaporate within individual basins until <10% of the original water mass remained (meaning millions of cubic kilometers were evaporated!). Again, this would imply that the ground was exposed at numerous points during the Flood (contrary to scripture). But it also requires that extreme evaporation could persist over significant intervals of the Flood (during which no water flooded the basins? ), which is not physically possible. Evaporation stops when relative humidity in the atmosphere reaches ~100%, but the more water is evaporated, the greater the relative humidity becomes. At 100%, the humidity returns to the ocean as rain. Thus the hydrological cycle would have prevented any large basin from evaporating enough water to deposit halite over its base. The size and thickness of chalk deposits has frequently been cited as solid evidence against the flood. Young-Earth geologists (esp. Andrew Snelling) have responded by offering pseudo-scientific calculations that supposedly account for the global mass of chalk. These calculations are scientifically meaningless, however, because 1) they assume that coccolithophores (which form chalk in the surface ocean) sustained unreasonably high productivity rates over a significant portion of years leading up to the Flood, 2) that the “fountains of the deep” provided nutrients to the surface ocean (instead of poisoning them, as discussed above), and 3) that all chalk produced prior to and during the Flood could have settled in a coherent deposit at the bottom of the sea (rather than remaining in suspension and mixing with other particles in the surface ocean—a more likely scenario if the Flood was accompanied by strong currents). Syntectonic deposits are abundant throughout the sedimentary record. As the name implies, syntectonic deposits form simultaneously with tectonic deformation of the local geology. If you’ve ever seen an alluvial fan collecting sediments from the side of a mountain, especially near a large fault, then you can visualize the painfully slow process in action. As the mountainside is exposed little by little, due to adjacent valley dropping in elevation every time an earthquake hits, pebbles and boulders are episodically washed into the valley. Because syntectonic deposits contain eroded pebbles and boulders of underlying sedimentary rocks, their presence in the geologic column makes no sense within a ‘Flood geology’ interpretation. Those underlying sediments must have been solid before they could be broken off and polished into smooth boulders found in most syntectonic layers. Syntectonic deposits in Echo Canyon Utah. Original photo by Matt Kuchta. Large extensional basins, such as Death Valley and the Great Basin in the US, contain thousands of meters of coarse sediments that were eroded from the adjacent ranges. These basins only deepen when infrequent, large earthquakes cause the valley to drop 1–2 meters at a time. Even if we allow that earthquakes were more frequent in the past, there is a limit to how fast semi-arid valleys can collect millions of tons of boulders in their center, because major flooding events are required to move these sediments several miles over a shallow slope. The total offset in large transform faults, such as the San Andreas fault, points to a very long history of slow deformation. Since its inception, the San Andreas fault has separated sedimentary deposits that appear on both sides by 150 miles, but the average slip rate today is only ~5 cm/yr. One could argue that the rate was higher in the past, but there is no direct evidence for this, and large episodic earthquakes can shift the fault blocks locally by only a few meters. On the other hand, there is evidence from the offset of modern gullies and streams that movement has been just as slow in the past. Offset of a small creek along the San Andreas fault. Image from Zielke et al. (2012). Radiometric dating confirms that modern slip rates of tectonic plates, as estimated by GPS data, remained relatively constant over millions of years. The ability to predict radiometric dates by uniformitarian ‘assumptions’ strongly corroborates plate tectonic theory and removes the assumption of uniformity of process. The abundance of oil in sedimentary rocks completely contradicts the young-Earth timeline, because oil cannot form within ~5,000 years at temperatures less than ~300°C—far greater than is found in every oil and gas field today. At best, the young-Earth scenario might predict sparse fields of natural gas, being produced by decaying organic matter, but instead we find hundreds of reservoirs containing billions of barrels of oil. There is too much organic matter in Earth’s crust to have been buried in a single flood event. Flood geologists must contend that most (if not all) of this organic matter—called the biomass—was alive or only recently dead just prior to the flood. Coal and oil reserves are the most obvious examples of ancient biomass, but nearly every sedimentary rock contains a little (up to 1%) by weight. When all sources are taken into account, we find that the biomass buried in Earth’s crust is 3,000 times larger than what is found today—far more than could have been present on Earth at any given time. 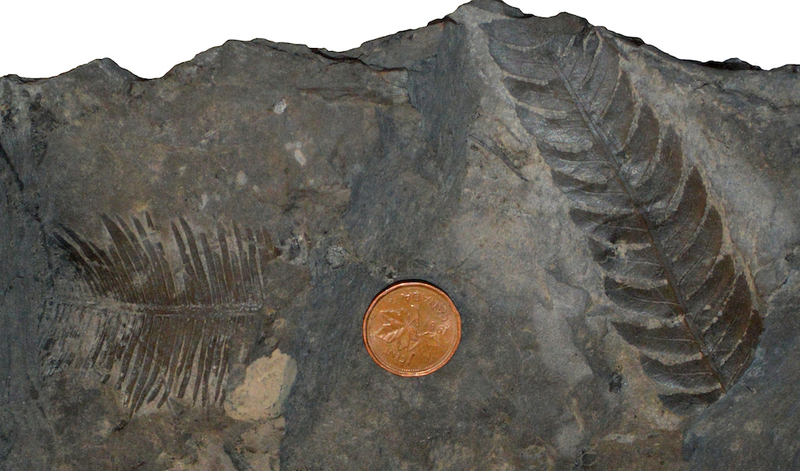 Early Cretaceous plant fossil in coal. Photo from Wikipedia commons. Coal beds defy rapid deposition, because the high concentration of organic matter begins with the slow accumulation of plant material in oxygen-poor swamps (and not by rapid burial of floating forests). The occasional preservation of leaves and woody material in coal seams would not be possible if all the buried plant material were fresh to begin with (as with rapid burial of existing forests), but requires that organic remains be at varying stages of decomposition. Coalification (turning plant matter into high-grade coal) is a slow process, which cannot be compressed to the young-Earth timeline. Experimental attempts to make artificial coal (cited by Snelling here) have only produced very low-grade lignite and coalified wood. Furthermore, these experimental setups (which do require high pressure/temperature and up to several months) rarely reflect natural settings and have yet to produce coal that closely resembles natural samples. If the majority of the Earth’s sedimentary rocks were deposited within a single flood, then those sediments should all be at approximately the same temperature today, and that temperature should be similar to the average water temperature during the Flood. It would take millions of years for a smooth temperature gradient to form (cool at the surface, hotter nearer the mantle), which is what we find today in deep wells. Remnants of soft tissue are extreme rarities in sediments older than Quaternary, possibly preserved in a handful of samples around the globe. Paleontologists continue to debate, for example, whether soft tissue in dinosaur bones derived from actual dinosaurs or microbial biofilms. But whatever the answer, we can all be confident that soft tissues are not regularly recoverable from Paleozoic and Mesozoic fossils. If these organisms were buried less than 5,000 years ago, however, soft tissues should be the rule, not the exception. According to the YEC timeline, mammoths and other megafauna died only years to centuries after the dinosaurs, yet we find hair, collagen, and even DNA in these animals all the time. So why not in dinosaurs and trilobites? Polystrate tree fossil. Note the base of the stump is rooted in a more organic-rich deposit, while the top of the tree is truncated sharply. Photo from Wikipedia commons. timeline for sedimentary rocks to have been ‘flushed out’ by infiltrating precipitation, because deposition would have to occur too rapidly. If the geologic column were deposited in a global flood, therefore, we should expect the groundwater trapped in deep sedimentary layers to be the very ocean water that once covered the Earth. Fossilized burrows and marine trackways reflect everyday conditions in ancient ecosystems, where worms, trilobites, or molluscs dug calmly through soft mud on the seafloor in search of food. The claim that paleontologists have unanimously mistaken these trackways for escape efforts during a catastrophic flood is not only presumptuous, but it ignores the bulk evidence. Trilobite trackway in Cambrian sandstone. Image from PaleoSearch. Mudcracks are common features in layers of sand, silt, and clay that are interpreted to have formed in floodplains or shallow lakes and tidal flats. Despite decades of being aware of the problem, Flood geologists have not satisfactorily been able to explain why mudcracks cover thousands of individual layers throughout the rock record. These features do not form under water, but require an exposed, drying surface of semi-cohesive sediment. Ripples readily form in sandstone under flowing water, but not at speeds required by the Flood. Therefore, the common preservation of small ripples cannot be reconciled with the Flood model, but rather tells us that the sand must have been buried in calm seas with gentle waves. 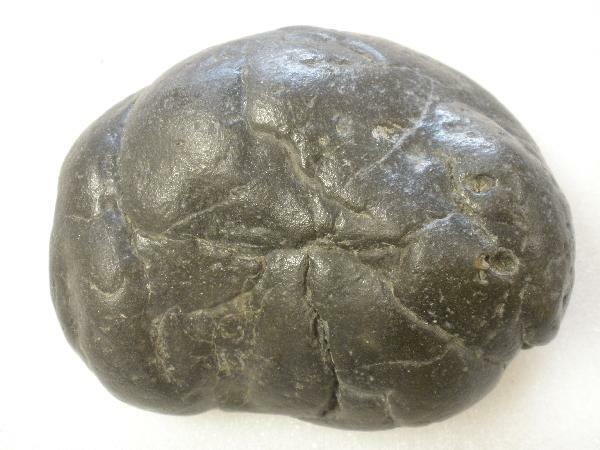 A 15-million-year old piece of poop, called a coprolite. Image credit. harden slightly in the absence of flowing water before another layer is deposited on top. Raindrops in sediments contradict flood geology outright. Fossilized poop, called coprolite, is found throughout the fossil record alongside the animals that produced them. These paleontological oddities are indicative of normal ecological conditions and contradict any scenario in which the ‘poopers’ were catastrophically buried. The nature of the fossil record contradicts the expectation of ‘rapid burial’ for most land-dwelling organisms. By and large, terrestrial fossils are the weathered remains of animals, which were long exposed to the elements before disarticulating and washing into a river channel, lake, or floodplain. Vertebrate skeletons are almost never found intact, and more weather-resistant pieces (like tooth enamel) are preferentially preserved, suggesting that rapid (live) burial was an extreme rarity in geologic history. Fine sorting of marine microfossils is inconsistent with the Flood scenario, because specimens of foraminifera, radiolarians, and coccolithophores are approximately the same size. Therefore, these tiny shells should be scattered stochastically throughout the sedimentary record, if they were subject to the same hydrodynamic forces of a single global flood. Instead, individual species are commonly confined to narrow zones in the fossil record and used as index fossils for dating layers of marine sediments. 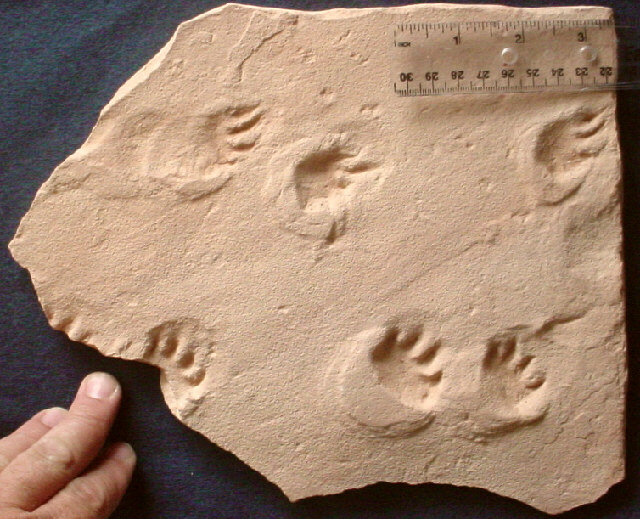 Cast replica of footprints made by a mammal-like reptile in the Coconino Sandstone near Ash Fork, Arizona. Photo credit: PaleoScene. Fossilized tracks in eolian (desert dune) deposits, such as the Coconino and Navajo sandstones, are inconsistent with the young-Earth proposition that these sediments accumulated under water. Extremely high sustained flow rates (>2 m/s) of very deep waters (up to 100 m or more) are required to form dunes of comparable size to those in the Coconino and Navajo sandstones. At these flow rates, it would be impossible for any submerged animals (especially small reptiles) even to make contact with the sediment surface, let alone for any prints to be preserved. The occurrence of widespread, eolian sandstone formations negates any model that cites a worldwide flood to explain their deposition. Of course, Flood geologists attempt to argue that eolian sandstones must have been laid down by water (more than 100 meters deep, flowing more than 2 m/s), but ignore the preponderance of evidence, which is more consistent with dry dune deposition. Paleosols are sedimentary layers that show evidence of soil formation by plants and microorganisms. Typically they can be recognized by distinct mineral compositions or chemical signatures, but direct reworking of sediment through biological agents may also be observed (for example, in situ roots and carbonate nodules). Not all paleosols show the same degree of soil development, but all are indicative of a long-lasting stable surface. YEC’s are forced to reinterpret paleosols as artifacts of chemical modification after rapid burial during the Flood, but geologists have become acutely aware of how to distinguish between these processes and true soil horizons. Animal tracks in general are evidence of an exposed surface, on which sediments were somewhat coherent (i.e. not too soft, not too hard; imagine trying to preserve your own handprint in cement). Nonetheless, YEC’s have deemed trackways consistent with their paradigm, because they insist that the floodwaters receded and covered the land numerous times. Besides the fact that Genesis 8 tells us the surface was not exposed until very late in the flood (and so their model contradicts scripture), it is very unlikely that any tracks could be preserved in those conditions. Once the floodwaters returned, they would tend toward erosional processes (removal of the entire surface layer, tracks included). The Flood model firmly predicts the absence of trackways in the sedimentary record, but in fact they are abundant. Fossilized nests, e.g. from dinosaurs, are indicative of stable, everyday ecosystems, and not catastrophic flooding of the continents. Both nests and eggs are fragile, which explains their rarity in the rock record. But abrupt burial in a high-energy flood cannot possibly explain their occasional preservation. The Grand Canyon itself is only deepened episodically during extremely high floods, which do not regularly occur in the modern climate of northern Arizona. Therefore, it must have taken numerous glacial cycles, during which the jet streams migrate southward and bring more rain/snow to the American southwest, to account for the great depth of the canyon today. The walls of the Grand Canyon contain numerous caves with speleothems, implying that the water table once stood high above its present position for extended periods of time. Catastrophic carving of the Grand Canyon cannot possibly explain these features, because it allows no time for caves to form and no mechanism by which they could be decorated with stalagmites and stalactites. Figure 1 from Noffke and Awramik (2013). 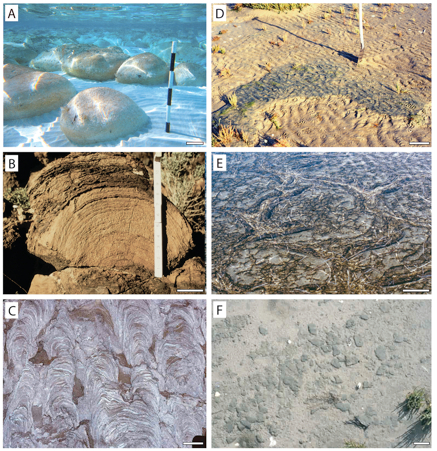 Modern and ancient examples of stromatolites and microbially laminated structures. Stromatolites and thrombolites are fine-laminated mounds built by algae and other microorganisms. These features not only take long periods of time to form, but their occurrence in repeated sedimentary layers argues strongly against catastrophic burial. They do not appear randomly in the geologic column, but are always positioned upright (in situ growth position) over wide areas within single layers of limestone—precisely what we’d expect if they grew in ancient oceans that slowly amassed limestone mud. Finally, these laminated mounds are frequently surrounded by fragmented shells of shallow-marine organisms typical of the same environment. Consistent patterns in magnetic reversals recorded on the seafloor strongly support the conventional model of plate tectonics, in which slowly forming oceanic basalts record the dominant magnetic signature at the time they were formed. YEC’s contend that these magnetic reversals occurred rapidly during the flood, but this proposal is easily falsified. If the entire Atlantic and Pacific basins formed during and/or shortly after the Flood, then Earth’s polarity would have reversed multiple times before oceanic basalts even had a chance to cool and preserve the signature! Flood geology thus predicts that either a single polarity signature should persist across ocean basins or the signature should be stochastic, with no striped pattern. Magnetic reversals recorded on the seafloor correlate to magnetic patterns in land sediments (e.g. 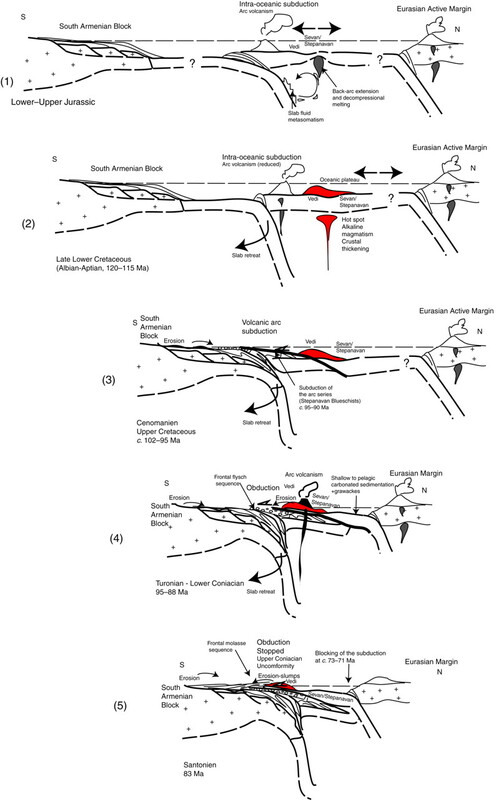 Heller and Tung-Sheng, 1982; Cunningham et al., 1994; Ding et al., 1999), vastly improving the dating of continental deposits that lack datable layers of volcanic ash. Where ash layers do exist, they allow for independent dating of magnetic reversals on land by the Ar-Ar method. This independent corroboration of dates improves the strength of magnetic ‘stripes’ on the ocean floor as evidence for an ancient Earth. Earth’s magnetic field is not decaying exponentially, but has varied much less over the past 7–9,000 years (e.g. Korte et al., 2011; Nilsson et al., 2014). Magnetic field strength was weaker, not exponentially stronger, for much of this interval. Attempts to suggest that the Earth cannot be older than 10,000 years due to an exponential decay of Earth’s magnetic field are based on a blind extrapolation of historical measurements (which span no more than 150 years) into the past. This approach ignores the abundance of paleomagnetic data from human artifacts, sediments, and recent lava flows. Figure 6c-d from Nilsson et al., 2014. Modeled history of the dipole moment of Earth’s magnetic field over the past 9,000 years, based on magnetic field intensities recorded by archaeological and geological samples. The entire field of chemostratigraphy makes no sense within Flood geology. First, the stratigraphic shifts in chemistry—meaning, as we analyze rock chemistry from the bottom of the geologic column to the top—are too large to have occurred during a single year. This is true particularly of isotopes of carbon, sulfur, and strontium, because the amount of these elements dissolved in the ocean is too large to be greatly affected within a short period of time. It would be like trying to change the water color of a swimming pool by dumping in a few cups of coffee! Event stratigraphy, which utilizes abrupt shifts in rock chemistry as time markers, helps geologists to correlate sedimentary rocks from very different parts of the world. When we examine sequences of sedimentary rocks that are rich in fossils, the order and timing of chemical events just happens to correspond to the order and timing of fossil events (e.g. the disappearance or first appearance of certain fossil species). This correspondence is not possible in the flood geology model, however, since the ordering of fossils in various parts of the world could not have been a matter of timing (i.e. it couldn’t depend on which day of the Flood they were buried). The mere existence of isotopes is not predicted by the young-Earth paradigm, but makes sense only in conventional astrophysics. Nearly all elements of the periodic table exist in various isotopes, due to their being formed in the process of stellar evolution. As stars grow larger, heavier elements are produced through nuclear synthesis. Outside of this mechanism, we should not expect isotopes to be a common feature in basic chemistry. Short-lived isotopes are detectable only from distant supernovas. These are unstable elements that decay relatively rapidly after formation and so should be absent in a 4.5-billion-year Earth. This discrepancy provides unambiguous support for the conventional age of our solar system and models of stellar evolution. Radiometric dating of chondritic meteorites is consistent between methods and yields ages of 4.56 billion years for our solar system. It is currently inconceivable how this date could be wrong by a factor of 1 million. Potassium-argon dating is well known for its potential problems, but still provides one of the best methods for dating ancient volcanic flows. Even when excess argon is originally present, as is evident in the dating of certain historical eruptions, the date is only apparently too old by a few million years at most. Therefore, K-Ar dates in excess of tens or hundreds of millions of years tell us clearly that the Earth is not young, because otherwise, we could not explain such high concentrations of argon in these volcanic rocks. The Argon-Argon technique removes most uncertainties about the original presence of excess argon in samples, confirming that K-Ar dates are both real and generally accurate. Corroboration of Ar-Ar dates by other methods—e.g. when applied to the Cardenas Basalts of the Grand Canyon—further improves our confidence in the respective techniques. Uranium-Lead dating techniques consider the decay of multiple isotopes (238U, 235U, and 232Th) into stable forms of lead. If the respective half-lives of these elements changed significantly in the past, then the technique simply wouldn’t work, because each half-life is vastly different. Accelerated nuclear decay, in other words, would result in massive discordance between age estimates from each decay chain. However, the U-Th-Pb method, especially when applied to pristine zircons, provides one of the most precise geochronometers for the bulk of Earth history. Flood geologists cannot account for the abundance of 230Th in secondary calcite deposits, such as speleothems, carbonate lake sediments, and corals. Since thorium is not soluble in oxidized water, these formations originally contained none. Therefore, present concentrations can only be accounted for by radioactive decay of 234U into 230Th, which has a half-life of 245,000 years. If modern corals, lakes, and cave deposits formed only after a global flood, some 5,000 years ago, then none should yield dates older than this. Cosmogenic dating utilizes short-lived isotopes that are created in situ by incoming solar radiation or high-energy particles from space. When rocks are exposed to the atmosphere, such as large boulders on the side of a mountain, they accumulate short-lived isotopes. When rocks and minerals are hidden, through burial under sediments or ice, short-lived isotopes decay at a known rate. Through a variety of methods, geologists have used cosmogenic dating methods to constrain the buildup and retreat of large ice sheets, development of alluvial fans, river plains, deserts, and other surface features across Earth. Of course, these dates invariably suggest that the most recent deposits on Earth are not less than 10,000 years. There is too much helium in zircons, contrary to what Russell Humphreys has conjectured in his unscientific analysis. Geologists regularly use the amount of helium in certain minerals to constrain rates of tectonic uplift, because it accumulates at a known rate (depending on the concentration of Uranium/Thorium), so long as the mineral stays below a threshold temperature. This method (U-Th-He thermochronology) regularly yields ages of tens of millions of years, which is to say that many millions of years were required to account for modern concentrations of helium. Cartoon illustration to explain formation of a particular type of ophilolite. From Rolland et al. (2010). Ophiolites are remnants of ancient oceanic crust, which have been thrust onto the continent. Geologists were originally confused by the large bodies of ultramafic (super rich in Fe and Mg) rocks on land. But by studying the chemistry and mineral composition of ophiolites, geologists recognized their oceanic origin and could identify the processes responsible for their formation. As it turns out, most ophiolites were formed near subduction zones (e.g. like we find around the Phillipines), and not in mid-ocean ridges. We know this because subduction of ocean sediments and crust influences the chemistry of newly formed lavas in a very specific way. And so, ophiolites tell a much longer story than the YEC could allow, in which 1) ancient (pre-Flood?) 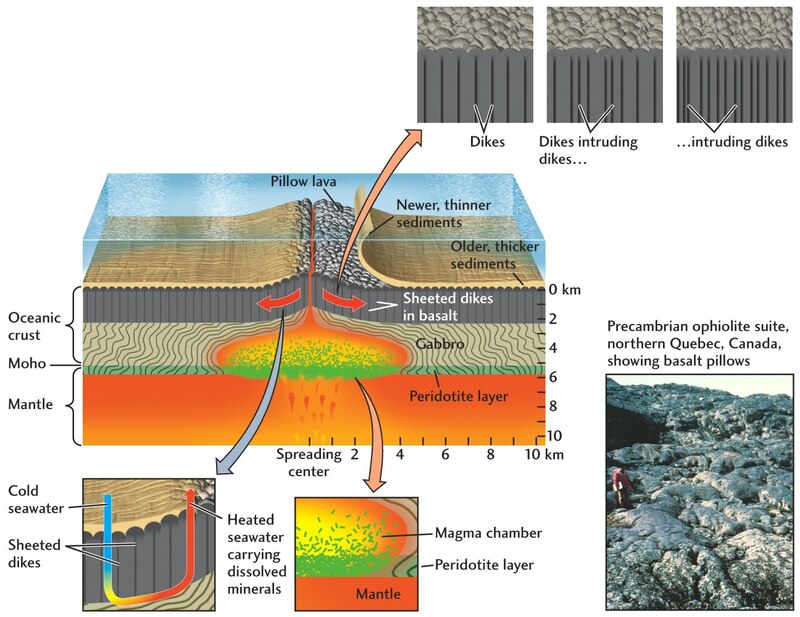 oceanic crust began to buckle until one plate subducted beneath another, 2) forming an island chain like Japan, which 3) began to stretch away from the continent, 4) allowing new oceanic crust to form, until 5) the entire suite was crumpled up as the island chain collided with the main continent, 6) ultimately preserving portions of the ocean crust and overlying sediments on land. Each of these steps requires more than a few thousand years. Cosmogenic beryllium (10Be) is present in volcanic emissions above young subduction zones, but absent in older ocean sediments. This radioactive isotope is formed continuously in the atmosphere, much like radiocarbon, but has a much longer half life. It is useful in dating certain marine cores, since the concentration of 10Be decreases with depth—as expected if the ocean sediments accumulated over millions of years. The fact that 10Be is present in younger subduction zones, such as the Lesser Antilles, indicates that ocean sediments were subducted and then recycled back into recent volcanic flows within a few million years. Since 10Be is absent, however, from the majority of volcanic emissions and from ocean sediments that are older than Pliocene in age, we can be confident in their conventional ages (>5 million years). Large igneous bodies take time to cool, such as those that comprise the core of the Sierra Nevadas, Andes, Rocky Mountains, and other large mountain belts around the world. Even in the presence of circulating waters, the sheer amount of heat originally present in magmatic intrusions requires hundreds of thousands to millions of years to dissipate, before the magma may crystallize completely into solid rock. This process is slowed significantly by overlying sediments, which act as insulators. Coarse-grained granite from the Town Mountain Granite. Coarse grains in igneous intrusions confirm that they indeed cooled very slowly, and not by rapid dissipation of heat via water or any other process. Only slow cooling allows for large, distinct minerals to form (called phaneritic texture), as is common in granite and diorite. Whenever you find a rock that resembles the image to the right, you have met a witness against the young-Earth paradigm. The intrusive igneous rocks exposed today were formed at great depths, indicating that miles of solid rock had to be weathered and eroded in the past. Even under catastrophic conditions, this process alone could take tens of millions of years. Today, granite exposures such as in the iconic Yosemite Valley continue to uplift in response to the removal of the overlying rock. Volcanic sills, which are intruded between sedimentary strata, require that the layers be hardened first. Otherwise, these lava injections have no physical guide that would confine their shape to lateral sheets of basalt. It is the brittle break between solid sedimentary rocks that causes volcanic sills to parallel the direction of bedding. Where is there time in Flood geology for sediments to harden completely, then to fracture and allow injection to form a sill, and finally time for cooling of the lava itself into solid rock? Volcanic dykes similarly require brittle fractures in the rock layers to explain their shape. Volcanic island chains, such as Hawaii, elucidate the multimillion-year effects of plate tectonic theory. Migrating lithospheric plates (and/or ‘hot spots’) cause the center of volcanic activity to migrate in a roughly linear pattern, resulting in a long chain of individual islands (which themselves are large volcanoes). Radiometric dating of volcanoes, from recently active to long extinct, confirms the predicted rate of plate motion based on modern observed values. Even if one rejects these dates, we must still account for the sheer size of the subaqueous mountain belts, which form gradually by periodic eruptions. It takes time for one deposit to cool and solidify, before another can be laid on top. Otherwise, a 33,500-foot shield volcano could not form, but only a relatively flat plateau of flood basalts on the seafloor. Extent of the Siberian Traps (blue line). Documented lava deposits shown in red; tuff in purple. Image from Wikimedia Commons. Volcanoes would have destroyed all life on Earth, assuming that volcanic deposits now preserved in the geologic column had to have formed during a single year. Massive eruptions have been well preserved, for example, in the Deccan traps (Siberia) or in flood basalts of the Snake River basin (northwestern U.S.). Geologists have modeled the impact of these individual lava flows on terrestrial and ocean life, and consistently conclude that each could have contributed to dramatic climate change and major extinction events. But these models assume that lava of the Deccan traps, for example, erupted over hundreds of thousands of years. Cumulatively—and if we require that all eruptions took place during the Flood year—these volcanic flows would have poisoned the oceans with heavy metals and saturated the atmosphere with carbon dioxide and sulfur gases. The sheer amount of carbon dioxide would have driven the oceans toward acidic conditions too vile for any surface life. Carbon dioxide emissions from volcanic events would have driven atmospheric concentrations to ~50,000 ppm or more. That’s more than 1,000 times what we find today! There is no evidence, however, for the extreme heating of Earth’s surface that inevitably would have ensued (on the contrary, YEC’s believe an ice age followed the Flood). Additionally, not enough time has passed since the Flood for such high levels to have equilibrated to those observed prior to the modern industrial age. The mass of volcanic deposits within the geologic column precludes the Flood geology model entirely. Large metamorphic bodies do not form rapidly, but require hundreds of thousands to millions of years worth of circulating waters under intense heat and pressure. The notion that catastrophic plate tectonics can explain the metamorphism of extensive mountain belts has no basis in physical science. Large sphalerite (zinc sulfide) crystals forming in ore body. Image from MGG&MS. 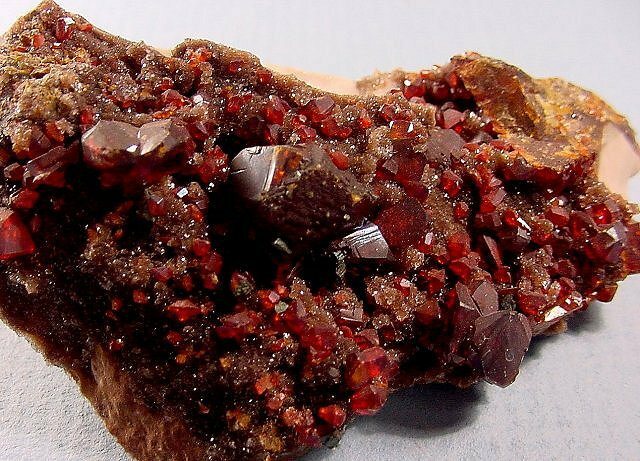 Gemstones and other rare minerals form by slow accumulation of rare elements in magma or in water circulating through rocks. The greater the size, purity, and quality of gemstones, the longer it would have taken to form them. Gemstones are thus a testament to the antiquity of the Earth. Radiogenic isotopes in rocks from the crust to the deep mantle indicate a long history of chemical evolution deep within the Earth. As large igneous bodies cooled at the surface to create continental and oceanic crusts, some elements preferentially were incorporated into solid minerals, while others remained preferentially in the liquid mass in the mantle. This chemical differentiation explains very well the difference in isotope ratios between the crust and deep mantle rocks, assuming that it occurred over several billion years. Young-Earth geologists, on the other hand, cannot explain the most basic geochemical features of the Earth’s crust and mantle. Catastrophic plate tectonics is the only way to explain the bulk evidence for plate tectonic theory in a young-Earth timeline. But two major problems arise: excess heat and lack of a viable mechanism. Though YEC’s feel they have been able to model rapid subduction of the Earth’s crust (accounting for the mechanism), they certainly cannot explain how this process did not destroy the Earth’s surface in a giant heat death. Excess heat must have transferred to the oceans and the crust, which would destroyed all life on Earth. There is no evidence of excess heating from catastrophic plate tectonics. According to John Baumgardner, the excess heat diffused by evaporating a ~1.5-km-thick column of water over the oceans. He claims this is a answer to the ‘heat problem’ above, which he believes is physically “comprehensible”. 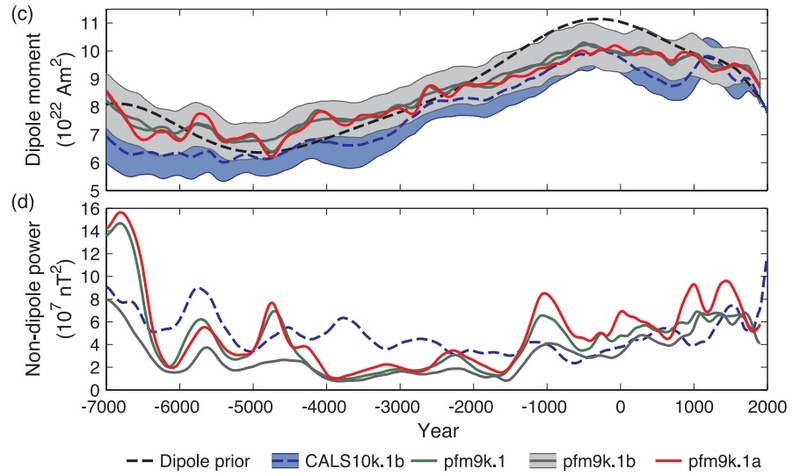 But the geologic record shows no evidence of large scale heating of the oceans, such as might be expected in stable-isotope proxies that work as paleothermometers (such as δ18O and Mg/Ca in carbonates or δD in clay minerals). Cross section of oceanic crust at a mid-ocean ridge. Image from a lecture slide found here. Catastrophic plate tectonics cannot explain detailed formation of new oceanic crust, as is observed today at mid-ocean ridges. Oceanic crust is not a homogenous mass of basalt, but develops distinct textures from top to bottom, due to different cooling rates and chemical composition. If the ocean floor had to form rapidly (in a matter of years), we should not find these textures in older sections of oceanic crust, far away from modern spreading ridges. Seafloor basalt is modified geochemically by hydrothermal vents that form in fissures near mid-ocean ridges. These vents are powered by hot, upwelling seawater that originally infiltrated far away from the ridge, where temperatures are much cooler. However, the catastrophic plate tectonic model allows no time for this process and would have created a seafloor that was entirely too hot for effective hydrothermal circulation. Therefore, the catastrophic model is falsified by the thousands of studies of the ocean floor, which find evidence of alteration of seafloor basalts in very old parts of the crust (such as the western Pacific). Radiometric dating of seafloor basalt has produced a famously coherent pattern of increasing age away from mid-ocean ridges. The map below is constructed by compiling thousands of analyses from dozens of individual studies across the globe. Though young-Earth geologists will argue against the validity of absolute ages, they still must explain the overall pattern, which makes no sense in their paradigm (even invoking accelerated nuclear decay). Age distribution of the ocean floor; image and data compilation from NOAA. The relative abundance of elements in the cosmos shows distinct patterns that make little sense in the young-Earth paradigm. For example, hydrogen and helium are super abundant compared to lithium, beryllium, and boron. Furthermore, elements of even atomic number are ~10 times more abundant than elements of odd atomic number. These relationships make sense in conventional astrophysics, because elements are produced over millions of years in dense stars through a process called nuclear synthesis. But YEC’s must explain them ad hoc: God simply created them like this. Relative abundance (on a logarithmic scale) of elements in our universe. Components of our solar system, including the sun, meteorites, and planets, have approximately the same chemical composition (if volatile elements are excluded). This coincidence is shocking, unless we allow that each was drawn from a primordial mass, as described by the nebular hypothesis. Accelerated nuclear decay is science fiction. Neither the physics nor the math produces a result in which radiometric dates yield consistently large ages for rocks and minerals in our solar system. One cannot tweak the physical properties of atoms, so as to increase the rate of radioactive decay, without all hell breaking loose—literally. Rates of decay depend on the stability of individual atoms, so if unstable atoms became more unstable, we’d expect stable atoms also to become very unstable, which would be the undoing of the physical universe as we know it. These are not conditions through which an Ark of humans and animals ever could have survived. This is a fantastic list. I’m sure it took some time, but I am also sure that if you had taken more time your list could have been much longer. Great list! I especially like the astrophysics bits (that’s going to be my major!). Along with the argument you made that the relative abundance of elements must be explained ad hoc by YEC, the same can be applied to stellar evolution. Why is it that we observe stars that appear to be at various stages of a lifecycle? Why do we observe stellar formation, protostars, main sequence stars, giant stars, white dwarfs, neutron stars etc and even observe transitions between these various stages- like supernovae. Did God just decide to make the universe look as if stellar evolution occurs? I wish I had the know-how to write a comprehensive list from the perspective of astrophysics and planetary geology; I’m actually a little ashamed that I don’t know these subjects better. As your studies progress, please feel free to submit an article on the topic. 🙂 I would be happy to host it here. Aren’t you assuming that the primary reason things exist is to be intelligible to science? Maybe God considered the observable phenomenon (regardless of its apparent history) as a worthwhile thing in itself – not something reducible to its origin. It’s not simply that things (like stars) appear to be old, but they have a history written in their structure, their chemistry, etc. The most parsimonious conclusion is that the history is real and these objects are old. I’ve heard it reasoned at length that both the age and history of the cosmos is only apparent, but this conclusion is entirely ad hoc. Without any good reason to conclude a history must be only apparent (and I think there is none), the explanation becomes arbitrary philosophizing and an attempt to skirt the evidence. I am curious, why do you think this limits the “kinds of art that God could have done”? I don’t see it this way. To me, it is merely the most honest investigation of the written word and its corresponding reality to accept the wealth of evidence in favor of Earth’s antiquity. No, as Johnathan said, there’s a difference between things existing to be intelligible to science and things existing which are intelligible to science. As far as I am aware things exist and they happen to be intelligible to science. I’m confused what this is supposed to mean. If we were there at the moment of creation it seems to follow that we would be observing the first matter. Is it possible to have creation without forming matter or the first objects? That seems like lack of creation to me. This seems to be speculating on what God does and does not find aesthetically pleasing. Couldn’t I also argue that God, as the artist that he is, wouldn’t simply let appearance alone dictate the quality of his craft? Why not give the universe a magnificent and long history of continuous creation of stars, planets, nebulae, galaxies etc. Why is that not equally, if not more, beautiful than a simple “skin deep” appearance without a real story to tell? That aside, it seems contrived to dismiss our inferences about the long history of the universe based on speculative ideas of what God would find aesthetically pleasing. We have observed numerous intermediary stages of stellar and galactic development. We have observed snapshots of stellar lifecycles: dense molecular clouds, T-Tauri stars (proto-stars), various main-sequence stars, different types of giant stars, white dwarfs, neutron stars, black holes, gamma ray bursters. All the puzzles pieces are in place. Along with this we have the mechanisms that connect these intermediate stages through a stars life. We have a good understanding of various fusion processes such as the proton-proton chain and the CNO cycle. We are elucidating the details of neutron capture (r-process, s-process, and p-process) which create all the other elements above iron which we can test by observing the chemical properties of stars during fusion and after stellar death. In fact, the link I posted above is a simulation of this process after a supernova. With the discoveries of many exoplanets over the last two decades we are beginning to piece together the processes behind planetary formation as well. It seems to me that many people believe that the study of nature would reveal God’s grand design of the world. Also, I wonder why a God would give his creation the ability to reason and exercise a creative intellect if only to suspend it when looking at Nature. @ageofrocks: Apologies for not being clearer; I’ll try to rephrase. What I mean by saying your view limits the kinds of art that God could have done is this: If things embody their histories in their structures and chemistries, then God could not have started with a world in medias res (without making things difficult for scientists who were interested in earth’s origins. And we seem to be taking it as a matter of course that he wouldn’t do that, even if it were merely a side-effect of his plans.) If God had snapped his fingers at any point to make an instant Matterhorn, or Betelgeuse, or Pacific Ocean, it would look much older than it really was from the moment it came into existence, by the very nature of its structure. There are people who say that if the beginning of Genesis is taken literally, it makes God a liar. But that simply assumes that scientific observation is the primary way God meant us to encounter all things, and I don’t think that’s necessarily true. Though things normally embody their histories in their structures, as long as we haven’t observed it ourselves a history is always an appearance we have to infer, and not necessarily the whole point of the thing attached to it. I am not saying it isn’t usually reasonable to extrapolate a chain of cause and effect from the structures of things. I am saying that because we have the beginning of Genesis and can take it literally, it isn’t just ad hoc speculation to think that the appearances of things may not reflect how they were created. (Also, to me a literal reading of Genesis avoids a lot of hermeneutic gymnastics that are implications of a non-literal reading). Pham asked, “Did God just decide to make the universe look like stellar evolution occurs?” Maybe God did in fact do just that – not that stellar evolution doesn’t occur, not that it hasn’t occured since creation, but maybe God wanted to start with the full range of stages in stellar life cycles. Think like an artist for a moment: generally making art that shows one’s entire creative process is only a minor consideration. Things are like art, I think. They exceed their histories. It’s fascinating that the solar system (for example) looks really old, but you can appreciate it without understanding it in terms of science. So I don’t find it perversely speculative or unparsimonious to believe that the world simply looks old. I guess I’m working from a literary perspective: if the world is an artwork, like a story, it’s hardly unreasonable to wonder if the Author started in medias res. And if the world is an artwork like a story, it isn’t how it was made that’s most important, but the story itself. The heavens declare the glory of God whether or not they were made the way they appear to have been made, don’t they? @Pham Nguyen: Re: your last comment, I don’t feel that I am suspending my creative intellect by saying that things might not be as old as they look. Science doesn’t seem to be made to account for exceptions like God’s creative act, that’s all. Re: “how would we ever know we had discovered the first objects or matter” I should have written, “and matter.” Or just matter. But I wrote “after” the moment of creation on purpose. Not “at” the moment of creation, because in that case we wouldn’t need scientific observation to tell us what had just happened. If we appeared on the scene in the moments afterward, though, fully equipped with the scientific method, current scientific knowledge and the relevant apparatuses of measurement, wouldn’t everything be interpretable as older than it really was? When scientists encounter “the oldest thing,” don’t they always look for the older thing that must have preceded it? As ageofrocks says, the parsimonious conclusion is the one to make. Not necessarily; it is entirely conceivable that any of these features, if instantly formed, could still appear very young by any scientific investigation. Therefore, you must assert that part of God’s artistry was to implant a false history that leads us to believe that objects appeared by other means. But we have not reason to believe that history would be false. And so, the most parsimonious conclusion is that it really happened. My position is that you cannot read Genesis literally (in the sense you imply); I think it destroys the biblical narrative and undermines the canonical function of Genesis’s early chapters. I’ve written about this elsewhere in a few posts. But since this seems to be root of your disagreement (you don’t seem to have any objections to the evidences I listed above), you should continue the discussion there in response to what I’ve proposed about reading Genesis. You’re right, our different opinions about the right way to read Genesis matter. I’ll check out your posts. But I think the crux of our disagreement can be summed up in this: “Therefore, you must assert that part of God’s artistry was to implant a false history that leads us to believe that objects appeared by other means.” I don’t have to assert that God implanted a misleading, false history in things in the active sense that you mean. Sure, the way God made things might seem misleading, but it only feels like a deception if you insist on looking at things with a distorted emphasis on cause and effect. I think he knew full well that scientists would get hung up on the age of the earth, but considered this much less important than beginning with something that had all the beauty of a structure indicating an age of x million years. This isn’t an unnecessarily complicating view. Throughout the Bible God seems more interested in doing things the way he wants to than in making them fully intelligible to us. Your position suggests to me that you think God would never let (mere) aesthetic concerns get in the way of a commitment to making the complete history of things available and intelligible to science. Isn’t it possible that you put too much importance on the latter and not enough on the former? Also, could Betelgeuse look exactly like Betelgeuse does now to scientific investigation if it instead appeared very young (seconds old, for instance) to scientific investigation? I don’t see how it could, in which case, from your point of view, if I understand it correctly, it would be unfair of God to start with a Betelgeuse that looks like it does now to scientists. That’s the kind of mindset I referred to when I wrote about limiting God’s artistic choices. Thanks for your patience, by the way. I know it can get frustrating to argue online, and the possibility of miscommunication is always a problem. The problem with this type of thinking is there is nothing wrong with it, however when you start trying to use science to justify a worldview instead of using science to gain a worldview that explains things you are bound to run into questions that lose a consistent logical answer. One of the issues I have with YEC is they want to answer each question one at a time, or only use their poorly explained examples like how the oldest desert is only 6kyo, which is a flat out lie. The irony I’m always struck with is that they will sometimes backpedal and start claiming the devil made the universe look this way, at which point they are granting more agency and power to a being that they see as inferior to their God, and yet by such an admission claiming that this being doesn’t object to having his creation modified by his supposed nemesis, or possibly cannot stop such action. But returning to the irony, the being that is supposedly truthful designed a universe that looks a certain way but is actually far younger strays dangerously close to Lastthursdayism, at the very least its making a claim that this supposedly omnibenevolent being is capable of deception. And therein lies the problem you can’t claim this being has the attributes it does in a universe like this, it becomes a logically inconsistent being, at which point another explanation of an insane God works but then this is an agent of chaos, hardly the ordered being its claimed to be. I know this is a geology blog, but when you bring supposed characteristics you can not possiblbly know about a supposed god into the discussion, you invite the same for the other participants. @Meadatron: I think you’re repeating the argument that I tried to respond to – that is, if you read the Bible like a YEC, then you have to say that God is a liar. But if you follow my argument and conclude that “there’s nothing wrong with this kind of thinking,” then God is not a liar even if he did create an Earth that looks old. It might help to think about what a lie is and what God intended when he created the world (as far as we can know from what the Bible says). What exactly was he communicating to us? Did he make the world for the express purpose of showing its history? What is the universe for, from a Christian point of view? Is it primarily for science, or not? Let’s not forget that the scientific account of the world’s origins isn’t the only one we have. The Bible provides its own account. If someone gives you a piece of art that looks like a photograph but was really drawn with a pencil, and then gives you a little book explaining, by the way, that it was drawn with a pencil, would you accuse them of lying to you? Of course not. You might even wonder why they gave you the book. When it comes to art, the point is not necessarily how it was done. If the world is like an artwork (and I think you could make a strong case for that), then deception isn’t even on the table. Lastthursdayism is much less plausible to me because there’s no reason to suppose it’s more likely than any of the other hypotheses about how the world originated. In the argument I sketched above, at least there’s the Bible’s account to consider. Keep up the good work. The misleading descriptions of the geology of God’s creation are insidious and pervasive among thousands of pastors, and hence the church. Hi Jon – quick thing I noticed – #61, you mention Wayne Ranney. He doesn’t have a PhD, he’s only a MS. He’s a very knowledgeable MS, though. Thanks, Tim! I love your attention to detail. 🙂 Even though I’ve read his book, I glossed over his full credentials and always assumed he had the Ph.D. I really appreciate jemzlinde’s comments. In favour of the possibility that God did create the world with an apparent age that was much older, I would like to add that there is definitely a precedent for that argument– in the form of some of Jesus’ miracles. When Jesus turned water into wine, the wine instantly appeared to have been aged to perfection. When he fed the five thousand, he made a few fish become many (each appearing as if they had lived whole lifespans already) and a few loaves become many (and if you had analyzed the grains, no doubt they would have appeared to have grown over months and harvested, ground and baked over days). And all the people he cured of diseases and deformities– those would healings, if they had (or even could have) happened naturally would have taken much, much longer than the spoken word of Christ. So no, it doesn’t seem at all complicating to scripture (although definitely to science!) that God would or could work in such a way. As Ecclesiastes 12:12 says, “Of making many books there is no end…” and this is the same for the whole origins debate. One can spend a lifetime examining all the evidence put forward by both sides. What I find most disturbing is not the evidence that one side or the other comes up with, but the consequences on how the rest of scripture is interpreted according to how one reads the first chapters of Genesis. If there was no literal six-day creation, then there was no fall into sin by a literal Adam and Eve as the Bible records. It would also mean that there was death before Adam and Eve’s existence, in fact, that this was how God designed the world to begin with. Then what did Christ really come to do? Thanks for your input. I considered briefly your analogy to the gospel miracles in a couple articles here and here. You may not find my analysis satisfactory, but I would encourage you to comment there if you have any further questions about my position. You voice a common objection to how Genesis could be interpreted if not literally, but I don’t share your conclusion that the gospel narrative is undermined if we abandon a ‘literal’ Adam, Fall, and creation over 7 days. For one, this ‘literal’ view was not ubiquitously held in the early church, yet they successfully formulated the foundational principles of Christian tradition. Later commentators likewise had no problem understanding the mission of Christ while rejecting a literalistic reading of Genesis. Rejecting a ‘literal’ Adam does not lead us to assert that mankind is not accountable before God or that pervasive sin does not bar humanity from communion with and reconciliation to God. The pertinent question is then “Who is Adam?” When the Genesis narrative is read in the literary context of its author, I don’t think the most plausible answer is “A single human being that fathered the entire human race.” We have better reason to believe, in my opinion, that Adam and Eve are representative of humanity in covenant with God, which is why the Eden narrative so closely parallels the story of Israel (and of Christ, for that matter). Please read my other articles on reading Genesis as literature and comment there if you have any objections. You say that accepting theistic evolution does not undermine the gospel. Here is irrefutable proof that shows otherwise (at least in some cases). While I’m deeply grieved by this pastor’s conclusions, I also have respect for his integrity in a way. He followed the implications of his beliefs on the origins of God’s world to its logical conclusions. This is not an isolated, extreme incident either– we have witnessed this happening in the faith lives of some friends and some of our young people. I think some who believe in theistic evolution are so focused on defending the scientific aspect that they never completely think through the scriptural implications, which is perhaps why they don’t hit a brick wall in their faith at some point. I did read carefully through the Banner article—thanks for the link. I hadn’t seen this particular article, but it sounds very familiar to concerns raised elsewhere within Reformed circles. In any case, I’m not sure I would call this proof that ‘theistic evolution’ undermines the gospel. It does, however, imply that Reformed traditions in particular (and perhaps their Catholic progenitors) will have to rethink the categories in which we speak of humanity and salvation. But scholars within those traditions have been doing that for some time (I’ll name B.B. Warfield, Henri Blocher, and Herman Bavinck as more notable examples, but there are hundreds). It is also noteworthy, however, that not a few Christian traditions, especially Eastern Orthodox, have operated for 2,000 years without holding to the distinctly Augustinian views of original sin and inherited guilt that are most threatened by ‘non-literal’ readings of Genesis. And so for them, the discovery of human evolution has never posed much of a theological challenge. From my perspective, your charge that some are too focused on getting the science right to notice theological conflicts—well, this may be true of some individuals, and I won’t question your personal experience. But by and large, it ignores the vast body of literature addressing the question of how to understand the gospel narrative within an evolutionary creation. I looked at the article and was actually surprised and pleased at the author’s open-mindedness and quest for truth. He was not saying, “An old earth does not fit my theology, so clearly the earth must be young”. He poses the questions thoughtfully without rushing to answer them. What I found was (a) Augustine’s formulation (which was taken up by Reformed theology) that we all sinned “in Adam” was based on a faulty translation that Augustine was working from, and (b) Paul’s statements in Roman’s 5 about Adam and original sin were just incidental add-ons to his main arguments in Romans. Like any Jew of the first century, Paul took the Adam and Eve story to be literally true, so he naturally drew on this literal interpretation to illustrate his other points. Number 46 – I think biofilms have now been more or less ruled out. The problem with many of your evidences is that they presume the young earth proposition is limited to 6,000 years where many YECs are quite comfortable with 50,000 years ( I in fact know few people who subscribe to Usher as being accurate..well except the likes of AIG). Worse your position on the fall not being literal is clearly heretical although many people are trying to desperately move the goal post theses days as to what heresy actually is. Saying the early church ever held such a view is playing loose with the facts. The early church was first century Christianity and there is not a whiff in Paul’s writing’s that supports the idea that he did not believe Adam and the fall to be literal. The amazing thing to me is that many of you seem to think your positions are going to help Christians but if the fall is not literal then you can twist and shimmy any passage in the Bible to the point where its meaningless and no thinking person would need take any tenet of the faith seriously. I can’t think of any intelligent person contemplating Christianity that will say “ah so the fall is not meant literally. I guess I will now give my life to Christ since he literally died on the cross and literally raised from the dead”. Might as well call the Bible a book of poetry. There’s nothing orthodox about such a take on things. Its tragically all so unnecessary on both sides. Many Jews have no issue with an old earth and a 6 day creation.HUNDREDS of years before the gap theory they were teaching based on Genesis that the earth had been created several times. Tragically even though they recorded such a teaching and its early date (in reference to modern geology) refutes it was an interpretation made to suit the geology of the day people continue to believe that any kind of recreation understanding of genesis 1 was merely a reaction to Geological discoveries. Uttery False. Their interpretation FAAAAR exceeds your appeal to the heresy that there was no literal fall of Adam and leaves them little conflict with modern geology (at least not enough to derail anyone’s faith). I directed my discussion toward those who uphold an age <10,000 years old, because I primarily interact with ministries like AiG, CMI, and ICR, who wouldn't allow for a timeline any greater. Yes, I realize that many YEC's are comfortable with 'transgressing' this boundary, but that's inconsequential to the purpose of this list. These evidences work similarly against those who would allow for an age of 50,000 years, or even a few million. Of course, the list could also be expanded to exclude any proposition shy of ~4 billion years, so I don't see why this is a problem. "..your position on the fall not being literal is clearly heretical…"
The nature of 'the Fall' is separate from the scientific question of Earth's age, and so I did not discuss it here. Never have I stated that the early church did not hold such a view, and I'll be the first to admit that Paul likely believed that Adam and Eve were two individuals in history, from which the entire human race is descended. But I don't accept that departing from this nuanced view of history is heretical. It certainly doesn't undermine Paul's message of the universality of sin and guilt, which he develops quite apart from the story of the Fall. "…many of you seem to think your positions are going to help Christians…"
I do, particularly because they've expressed to me the personal benefit from exploring these positions, even if they still disagree in the end. "…if the fall is not literal then you can twist and shimmy any passage in the Bible to the point where its meaningless and no thinking person would need take any tenet of the faith seriously…"
I believe this is a non sequitur, and the claim that no thinking person would take the tenets of the faith seriously is demonstrably false. You presume that reading Genesis 3 as anything but a concrete and flatfooted description of a single event in history is to "twist and shimmy" the passage, but the story is rife with indicators that it speaks more imaginatively and metaphorically than this. It is probably a misnomer, therefore, to label these views of the Fall as "literal" or "not literal", because the question at hand is really "Who is 'the adam'?" If 'the adam'—this character deprived of a proper name and known only as 'mankind'—is a literary depiction of humanity in covenant with God, then it matters not whether we assert that he was also an individual in history. We may still conclude with Paul that all share in his fate of mortality, exile, and death, because all sinned. "Might as well call the Bible a book of poetry. There’s nothing orthodox about such a take on things." This seems a little extreme, especially since at least half of Christendom (namely, the Orthodox church and much of Protestantism) does not emphasize the 'literalness' of the Fall in terms you describe. You're arguing for a slippery slope that doesn't exist. "Its tragically all so unnecessary on both sides. Many Jews have no issue with an old earth and a 6 day creation… [the] recreation understanding of genesis 1 was [not] merely a reaction to Geological discoveries. Uttery False." Especially helpful are his discussions on the Fall, and Paul’s use of the narrative in Romans and 1 Corinthians. He likewise rejects a “literal Fall”, at least in the rigid sense you employ this term, and so many of his arguments sound familiar to what I’ve said on this blog. Interestingly, he also comments on whether the term “mother of all the living” demands that Eve be a sole female progenitor of all human beings—it does not. Reading back through the comments here, it’s important to reiterate that rejecting a ‘literal Fall’ in the strictest sense (that the first sin was literally taking of a piece of fruit from a forbidden tree) is not a rejection altogether of mankind’s historical fall into sin, forming the foundational background to the Gospel. The cyclical pattern of covenantal calling, disobedience (“Fall”), exile, and redemption (New Creation) throughout the Hebrew Bible, to which the Gospel is a climactic fulfillment, exemplify the Fall as a prototype for the covenant relationship that would unfold. Though it is a historical precursor as well, it is also the metanarrative for all of mankind, who is called to covenant with God. Hence Paul’s analogy works so well, “As in Adam, so in Christ”. We do not attain to the image and covenantal status of Christ by being his physical descendants, but by living his narrative in faith. So, after submitting a few comments of a foul nature, which I deleted from this page, Mr. T. Blacksman threatened to create an endless stream of fake IP’s and identities to skirt any potential ban, in order to “teach me that my actions have consequences” (namely, disallowing vile speech, which resorts to insult over dialogue). Previously, I didn’t require new commenters to pass moderation on this site, because I’ve seen how the process can be abused to present the illusion that one is without critics, and I’d prefer that your comments are immediately visible. If you see that your comment is awaiting moderation, forgive me for any delay in approving it. But so long as it is relevant to the post, it will be posted (whether or not you agree with my position!). Since that time, Mr. Blacksman programmed bots to spam my page (more than 100 times in a few hours) with a special collection of insults and childish accusations. Each set of comments used a different IP and e-mail address, making it impossible to ban him from the page or to catch them with spam filters. In essence, he is trying to bring down the page singlehandedly by resorting to the tactics of a 4-year-old whose been assigned to ‘time out’. Of course, his efforts turned out to be only a minor (albeit somewhat humorous and pitiful) nuisance. While Mr. Blacksman’s reaction is certainly a compliment to the strength of geological evidences listed here, it is unfortunate, because the theological dilemmas raised by them (such as how to interpret the Fall in Genesis 3) ought to be discussed openly. So I encourage you, if you disagree that we can understand the Eden narrative somewhat allegorically as a reference to mankind, to pose your questions in comments or via e-mail. I would be happy to discuss the relevant biblical texts and listen to your thoughts, because I’m not exactly resolute in my own. In any case, I want to clarify that one need not reject a ‘literal’ reading of Genesis 3 upon accepting that the Earth is ancient (or even that mankind evolved). Various authors have formulated rather successfully how this might be done, and I respect their positions too. This is an excellent rebuttal to CMI’s “101 reasons for the young age of the Earth and Universe”. Only that its far more well thought out and researched than CMI’s article ever was. T Blacksman’s vitriolic attacks and theologyarchaelogy’s vague rebuttals are proof that you struck a nerve among creationists. Keep up the great work. Will be sharing this. On a slightly unrelated note, how do you feel about the Biblical narrative of Genesis, that it doesnt seem to tell us anything about the origin of the Earth and Universe(other than the idea that God made them?) Do they hint at anything? That’s a good question, which I can’t answer fully, because I really don’t know. I’m inclined to say with Walton and others that no, the text reveals nothing about the material origins of the cosmos (process, timing, etc.). Though simultaneously, I have to believe that it could, in principle. Thing is, it is easy to pull things out of the text retrospectively (such as a big bang cosmology), but quite impossible to establish any of this as exegetically necessary. For example, when I read Genesis 1 now, I do see an evolutionary creation, set on its path by God. In Genesis 3, we hear of Eve’s expectation of increased pain in labor/childbirth. I can’t help but to think of the fact that what separates mankind biologically from other primates—namely, his brain capacity—is largely responsible for the awful pain of labor (the brain evolved faster than the pelvis, because we began to walk upright). It’s as though the text is telling us “in obtaining knowledge of good and evil, yet choosing evil, you’re nothing but another animal with an oversized head”. I think that Genesis 6–11 certainly have their historical referents, but the historical value is so buried in rich language, theology, and polemic, that we should be extremely cautious in trying to extract it (it was obviously not the main thrust of the text). Perhaps one history lesson we could take from the early Genesis narratives is that from the beginnings of mankind (whenever that was), God has called us to be truly human—something beyond our mortality, beyond what we are biologically. He formed us ‘from the dust’, meaning from a life filled with only toil and death, and made us more than meat and bones. Rather than use the text to constrain what historians are allowed to discover, therefore, perhaps we should marvel that wherever we find our species in history—there God was. So I was reading through your list and I was reminded of a very convincing pattern that I read about some years back in Kenneth Miller’s “Finding Darwin’s God.” It is the list of persistent nuclides by half-life. All the ones that have a half-life of 80 million years or less are not found in nature (our region of the solar system), whereas the ones that have half-lives greater than 80 million years are. The implication is of course that nuclides with half-lives less than 80 million years have decayed away over deep time, whereas the others have not yet. I found the list online here. Thanks for the link! I was not aware of this list, though I do know Dalrymple’s book and the evidence from short-lived nucleotides (not sure why I didn’t include it above—maybe in the next version?). I’m actually not sure how YEC’s deal with this evidence, except perhaps to conjecture that short-lived isotopes all decayed away in response to accelerated nuclear decay. Some people still won’t be convinced. I have only just found this page (ironically via one of your detractors), but I wanted to say ‘well done’! Creationism as a scientific theory should be opposed, for it is dangerous and undermines science. It hurts the future of scientific endeavour. I found your page doing a search for such matters and am really impressed. I have been going through quite a bit of anguish in the last few months realizing, that after forty years, nearly everything that I believed in and was taught is false. I do feel betrayed but yet enlightened. YEC’s are really desperate now it seems. I am at the point where I believe the earth is around 4.5 billion years and the OT cannot be taken literally if you want to appreciate it. But I am not yet convinced that life evolved. I also still believe in Jesus Christ mainly because of the testimony of Saul of Tarsus. His letter to the Romans is quite persuasive. So do you believe it’s possible that life was created by God but the physical world evolved over 4.5 billion years? Can one still be a Christian and not take the OT literally? Some say you cannot. Thank you! Regarding your questions on evolution, I would defer you to the excellent resources at Biologos.org. Personally, I am not persuaded that Romans or any other text is a significant barrier to accepting common descent within a Christian worldview. The question is too involved to do justice here in a comment, so I hope you’ll take a look at essays by N.T. Wright and others at Biologos, since their reasoning aligns rather closely with my own. As far as taking the OT literally, I have written a couple articles on this very topic. The short answer is: Genesis (and the OT in general) is first literature, even if it touches on historical and even scientific observations/claims. To read the text literally is to be faithful to its genre and historical setting, which requires careful attention and study. For example, the seven-day structure in Genesis 1 appears to describe a simple timeline, but it presents God as working during the day, resting from evening to morning, and then continuing his work as a normal Israelite. Does God need to rest while the sun is down? The text reads thusly, which should tell us immediately that it is not a straightforward record of history (or an Earthly timeline). Over the last couple of years I have slowly and agonizingly realized the everything I have believed, studied and been taught over the last forty years is false. It is tough to take. I feel betrayed but yet enlightened thanks to sites such as this. I do believe now that the earth is around 4.5 and that the OT cannot be taken literally if it is to be appreciated. However, I am having trouble letting go of Jesus Christ. The testimony of Saul of Tarsus, especially in Romans, is quite convincing and to a lesser extent the disciples. I also still believe that life was created by God. Which God I don’t know for sure. I certainly am open to the evolution of life if it can be shown and I realize science is a never ending process of discovery. My question is do you believe it’s in the realm of possibility that life was created on an earth that’s 4.5 billion years old? Can one still be a Christian but not believe in the literal stories of the OT such as Adam and Eve which seems to be the kicker? I really appreciate you sharing your thoughts and story. It’s extremely common, unfortunately, and many don’t find resolution. I wish I could do more than exhort you to keep studying, on the one hand, and keep meditating on the joys of your faith, which itself didn’t betray you. Much of the intellectual betrayal of YEC is done sincerely for the hope of sharing God’s truth, and not with malintent. Unfortunately, too many of faith (e.g. Ken Ham) gain a false confidence in their message, and it does more harm than good. I’ll pray you find resolution, and do not hesitate to write. You’re not alone in this struggle! Although many people will say otherwise (Richard Dawkins and Ken Ham spring to mind), observation shows that it is perfectly possible to accept the facts of an old Earth and evolution, and at the same time be a sincere believing Christian. In this context, I would recommend Dennis Venema’s writing at Biologos, or, from the Catholic end of the spectrum, Ken Miller’s Finding Darwin’s God. The same kind of evidence that tells us that the Earth is some 4.5 billion years old also tells us that life has been around for at least 3.5 billion of those years. It is possible to believe that life was specially created at that point, or (and this must be the implicit assumption of any attempt at scientific understanding) that it emerged as the result of natural processes. it is also possible to believe – I am pretty sure that both Dennis Venema and Ken Miller do believe – that the laws of nature that made this possible are a manifestation of Divine Creativity. If you have been told that the Earth is young, you have been lied to. If you have also been told that you cannot be a good christian and accept the evidence for evolution, you have been lied to twice. (Working backwards through my email, I see that most of my points have already been covered. In addition, serious biblical scholars have argued for centuries that *on internal evidence alone* it is apparent that the OT account is not to be taken literally. Arguments include discrepancies between Genesis 1 and Genesis 2, the fact that the “generations of Noah” list relationships among peoples as if they were relationships between individuals, and the reference in the Noah’s flood story to God having changed his mind about creating humanity. From this perspective, it is the literalists (a relatively young breed), rather than the modernists, who are ignoring the plain meaning of Scripture.